There's good news and bad news. The gender gap at the top of the world’s largest public companies is closing – though progress is painfully slow. New research from S&P Global Market Intelligence reveals that the number of female CEOs at Europe’s 350 largest public companies has more than doubled over the past eight years – to 14, from six in 2009. This works out at one new female CEO every year, S&P says. The research found that women are at the helm of just 4% of S&P’s Euro 350 index firms, which account for around 70% of the Europe’s equity market by capitalization. In the United States, companies in the S&P 500 have fared marginally better in closing the gender gap. As of August 2016, 27 had female CEOs, compared to 18 in 2009. That works out at 5.4% of companies on the index run by women. Have you read? A CEO's best investment? More women leaders How women leaders increase company profits Do women-only quotas work? S&P analysed 10 industry sectors, and found that four in Europe (healthcare, materials, energy and IT) and two in the US (materials and telecoms) did not have any female chief executives. 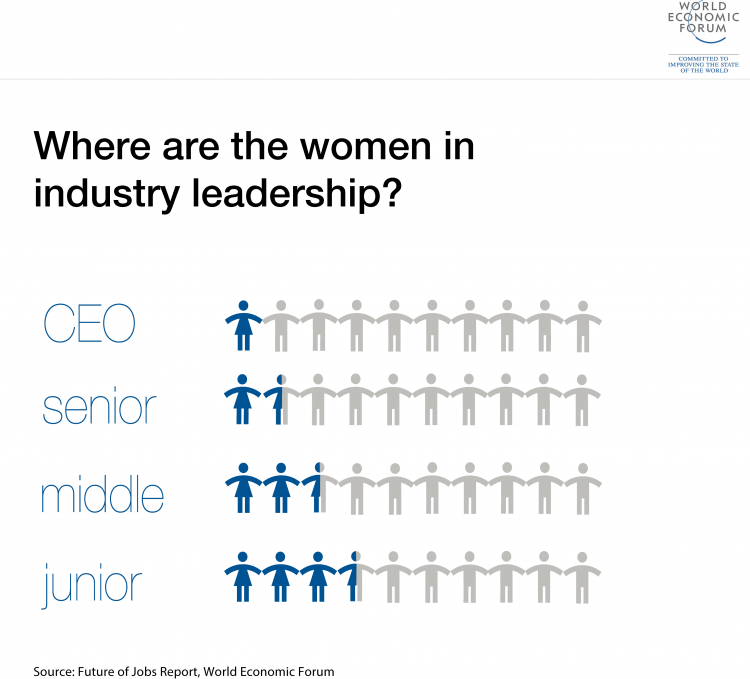 In the US, the IT, utilities and consumer discretionary sectors have the most female CEOs, with five companies each. There’s a noticeable difference between the two indices when it comes to telecoms: there are three female CEOs in the S&P Euro 350, compared with zero female CEOs in the S&P 500. In 2009, the S&P Euro 350 did not have any female CEOs in telecoms at all, so it appears the sector is leading the way in closing the CEO gender gap. At least in Europe. But it’s not just about the number of women holding the top roles. There’s also a gap between male and female CEOs in terms of how long they spend in the job. Female CEOs stay in office for two years less than their male counterparts, says S&P; and that's in companies in both the European and US indices. The research reflects the slow progress being made by the corporate world in appointing women to leadership positions, which is despite mounting evidence that having women in leadership roles can boost companies’ profits. Research from the index provider MSCI found that organizations with strong female leadership deliver a 36% higher return on equity. A different study by the Peterson Institute for International Economics and Ernst&Young analysed nearly 22,000 organizations in 91 countries, and found that if 30% of a company’s leaders are women, its net profit margins are 6% higher than those of a firm without women in top roles. There are just five countries around the world where companies have at least 30% of women in leadership, the EY and Peterson study found. The World Economic Forum has been measuring gender gaps across the world for 10 years. Its Future of Jobs Report 2016 highlights that women aren't just underrepresented in CEO and senior roles but also across mid-level and junior roles.